Last May, after we launched a much improved app on our platform, Google objected on a number of grounds. We took our app down and agreed to work with Google to solve their issues. This week, after we addressed each of Google’s points, we re-launched the app, only to have Google technically block it. [...] It seems to us that Google’s reasons for blocking our app are manufactured so that we can’t give our users the same experience Android and iPhone users are getting. The roadblocks Google has set up are impossible to overcome, and they know it. 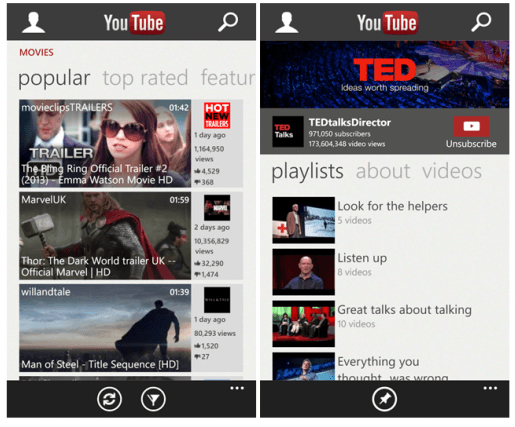 A new YouTube app for Windows Phone is now available on Microsoft's mobile marketplace. The company originally launched a YouTube app that it built internally in early May, but it was taken down due to a discrepancy with Google. In short, the app violated Google's terms of service, leading to Microsoft being served with a cease and desist request. The problem revolved around the absence of ads and a feature that allowed users to download videos from within the app. Microsoft was quick to pull the latter but its updated app was still devoid of any ads, blaming Google for not providing the necessary APIs. Now it appears the two have decided to play nice and work on the native YouTube app for Windows Phone together. A Microsoft spokesperson confirmed yesterday that the company has dealt with the issues Google expressed back in May and will now include ads. That app is now available in the Windows Phone store with a host of new features including video upload support, live video streams and YouTube channel page editing, among other things. The Verge reports that in its hands on test the video uploading only works when the device is charging and connected to WiFi, otherwise the upload is interrupted and fails. Along with YouTube profile editing and playlist management, the app now allows users to pin channels, videos, search queries and playlists to the home screen with Live Tiles. You can also expect to see the standard social integration, allowing users to share videos directly to there favorite networks, as well as in texts and emails. Youtube for Windows Phone is available now on both Windows Phone 7.8 and Windows Phone 8.